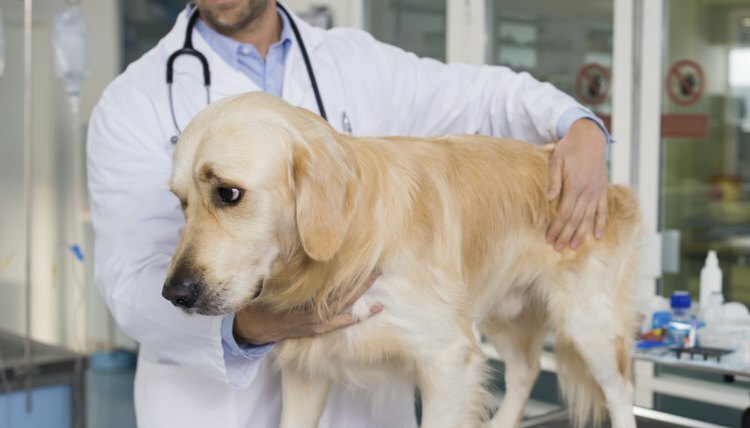 If you’re trying to sort through the best approach to treat your dog’s liver disease, consider that liver disease is a pretty broad category, referring to any medical condition affecting your dog’s liver. Before the vet determines the best approach for healing your dog, he’ll have to understand exactly what type of liver disease your dog has. Options for treating liver disease include medication, supplements and surgery. Liver disease in dogs may be classified as chronic or acute, which is more common. Chronic liver disease can be caused by genetics, toxins or infections, such as hepatitis or leptospirosis, or it may be idiopathic. Causes of acute hepatitis include trauma, infections and toxins. Despite the differences in potential type and cause, the symptoms are largely the same, including jaundice, decreased appetite, increased thirst and urination, vomiting, lethargy and diarrhea. Blood and urine tests, ultrasound, radiographs and biopsies are all tools the vet uses to determine the cause of liver disease, which will dictate the treatment. Conventional treatment of liver disease uses a variety of medications to address the cause and symptoms of the liver’s malfunction. For example, a dog with chronic hepatitis will benefit from corticosteroids to reduce inflammation and scarring. Antibiotics are typically prescribed if infection is involved, or if the dog is vulnerable to secondary infection. Anti-nausea medication, such as cimetidine, is often used to minimize vomiting and prevent stomach ulcers. Fluid therapy is routine in treating liver disease, to keep the dog from becoming dehydrated and to help maintain a balance in his electrolytes. In the case of liver cancer, chemotherapy and surgery to remove the affected lobe are often necessary. Diet can play an important role to promote the liver’s good health. Part of the liver’s job is to detoxify ammonia and turn it into urea to be excreted by the kidneys. If the liver is compromised, it isn’t able to metabolize ammonia properly, leading to a buildup of ammonia that can affect the brain. Therefore, it’s important to minimize the production of ammonia, which is done by using high biological value proteins, which can be absorbed and used easily. Eggs and fish are of the highest biological value, compared to corn and soy, which are much lower. Highly digestible carbohydrates, such as potatoes and white rice, also are recommended to minimize ammonia production and supply energy. Vegetables do double-duty providing fiber and acting as a source of complex carbohydrates. Of course, other medical conditions will affect dietary choices, so it’s wise to collaborate with your vet to choose the right diet for your dog. Supplements can be helpful to treat liver disease. Milk thistle, otherwise known as silymarin, is a popular supplement for the condition. It works by displacing toxins in the liver and prompting the organ to regenerate faster by promoting the production of new liver cells. S-adenosylmethionine, or SAMe, is produced naturally by the liver to support its function and structure. Available as a dietary supplement, SAMe can protect the liver against future damage and may help the liver repair itself. Other potential useful supplements for a dog with liver disease are vitamin E and vitamin K, as well as choline, burdock, licorice and dandelion root. Treating liver disease in a dog depends on what the condition is and how quickly it’s diagnosed. Since the liver is able to regenerate itself, early treatment can make a tremendous difference in the condition's outcome. Supportive care in the form of fluids and nutritional therapy, such as force-feeding, is often necessary, regardless of the illness, while other treatment protocols will depend on the unique condition. How Often Should I Feed My Koi?